Two sister dailies have given their backing to the launch of a special day to celebrate one of England’s counties. 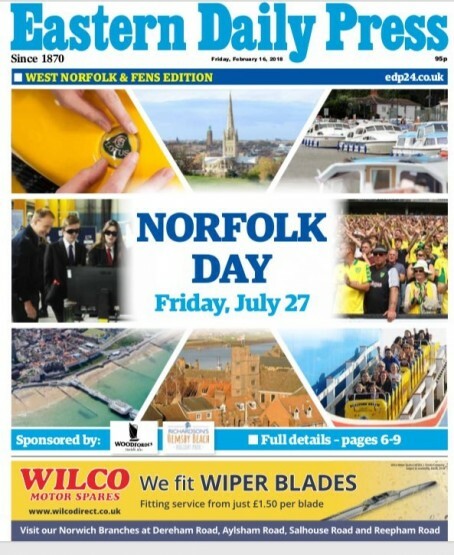 The Eastern Daily Press and Norwich Evening News are supporting the inaugural Norfolk Day, which will be held on 27 July this year. The initiative, also backed by BBC Radio Norfolk, is described by the EDP as “a day of fun, a day for laughter, a day to show how proud you are to live here, and day in which everyone is encouraged to get involved”. The newspaper splashed on the event’s launch on Friday. Editor David Powles said: “We’re all really proud to call Norfolk home and we know there are thousands of people out there who feel the same way as us. The two newspapers’ Archant sister dailies, the East Anglian Daily Times and Ipswich Star, are current supports of Suffolk Day, in the neighbouring East Anglian county. Suffolk Day was first marked on 21 June 2017. Obviously running short of news again. It’s just more bandwagon jumping which has replaced the long standing tradition of the EDP being at the forefront of local issues and being known for its proactive campaigning,however with its readership and copy sale numbers in free fall they’re no longer the voice of the county they once were a decade or so ago as they don’t have a large enough audience. Interesting that the logo for this just names the EDP rather than ‘Archant’. Not a ringing endorsement for the Norwich Evening News or any of the county weeklies, I’d say. It is in the school holidays.So the local people who are asking the question don’t have children or grandchildren at school obviously.